It would seem that once you get a book published, people will want to hear you TALK about writing. I’m not sure I’m what you’d call an expert about writing just yet, but I sure can talk. And unlike some of my more introverted writer friends, I like to talk. My husband will attest to it. 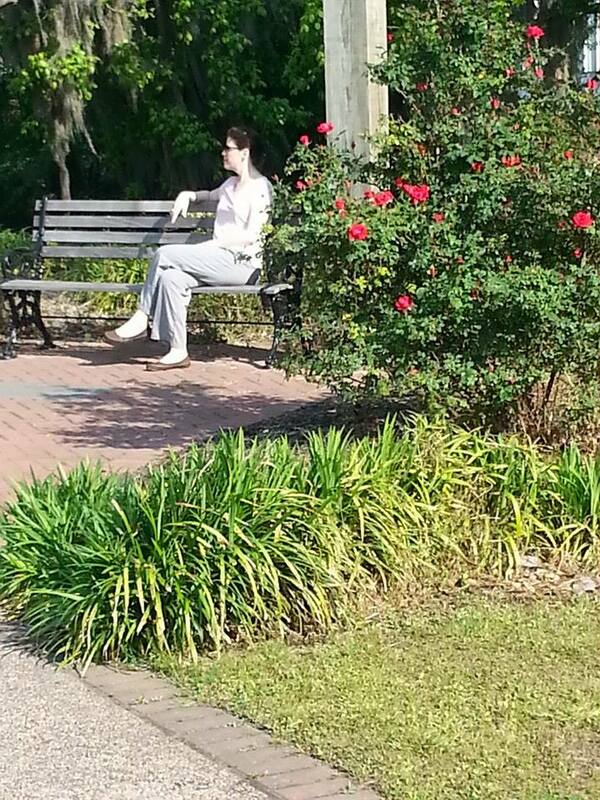 A moment of peaceful contemplation pre-talk in Conway, SC. So last Saturday I had my first talking gig. I spoke to some up and coming writers at a workshop hosted by the Friends of the Library in Conway, SC. Which happens to be the town where I went to college, where I met my husband, and where I have family living. NOT a hardship to travel back there. It was a hoot. I had 30 minutes and could have taken up much more. Not that anyone would have wanted that, but I could have. My instructions were pretty simple–talk about your journey to publication. I hit the highlights, tried to focus on the bits that would be useful to people who want to be published, and then asked for questions. And we had a lovely chat, me and that room of people. I’ll be speaking again at Connemara–the Carl Sandburg National Historic Site–at the end of May. And once again when I have my book launch in August. Hopefully, that’s just the tip of the iceberg. But the upshot is–I need some topics. My journey to publication is fine, but I plan to have a menu of subjects to delight and entertain audiences. But what? I thought it might be nice to give a talk about the Ministry of Food. In Miracle in a Dry Season the characters work together to feed the town during a drought. And by feeding them, demonstrate love, compassion, and forgiveness. We live in a world with way too many people who need to be fed–that’s a topic I can definitely warm up to with no shortage of Biblical examples. But what else? I’m asking YOU. If you came to hear me speak, what would you want to hear? And how long would you like it to go on? Give me some pointers. I aim to please. I always like to hear about that connecting point, the one where a person goes from a writer with a manuscript to a writer with a contract. Was it through a conference, multiple submissions, an agent–how and who gives encouragement. Have fun on your tours! That is the defining moment, isn’t it? Thanks for chiming in! I would like to be told where you get your inspiration, how you stay the course in spite of discouragement, things you learned along the way that you had no idea about, and of your interaction with all the kids you’ve met and “lived with” along the way. Who took the picture? Sarah, This past week end I attended a 2 hour workshop at The Writer’s Loft, MTSU, Murfreesboro, TN. Darnell Arnoult was the speaker – she spoke for a full 2 hours – and ALL of it was germaine, insightful, encouraging, revealing… I took 5 pages of notes (which I am willing to share with you if you wish – just send me a personal e-mail). The workshop was titled, “Drafting The Novel”. Darnell touched on The “Sublime Fiction Triangle” and Nigel Watts 8 point arch, starting with scenes which will eventually become chapters or parts of chapters, the “discovery, discernment, decisions, drafts” process, 5 attributes of your characters, the difference between a novel and a story…. and more. She also gave several writing help book titles / authors along with several books that she deemed good examples of novel form. Perhaps these things can be tossed into your “talk salad”. Sounds like a fantastic workshop! I’m familiar with Darnell–she’s absolutely wonderful. Thanks for sharing what she covered–examples from other speakers is always helpful! Some random thoughts on speaking – I used to do a lot of it. * If there’s a podium, don’t grasp it with both hands – that puts a wall up against the audience, and they can feel it. If you have to be behind the podium, lay one hand on it and use the other to gesture. * Begin by offering thanks to the people who made your talk possible. * If you make a joke, give it two beats – about the time you need to catch your breath after a long run of talking – and then go on if there’s no laughter. Don’t ever wait longer than that. * Look at individuals in your audience, but never at one person for too long. Make eye contact, and skip to another part of the room. * At question time, remember that at least half the questioners are trying to think of something to ask that will make THEM look good. It’s natural, so expect it. * When you’re done, say a simple “thanks” and leave. * Remember that we hear a lot of public speaking from ‘talking heads’ and stand-up comics, and it’s easy to subconsciously adopt some of the mannerisms you see. It’s really best to avoid it, unless there’s someone REALLY good, and you have the chance to practice to the point where you’re not simply aping the style. * If you get a heckler, don;t engage. It’s not your job; one of the organizers should deal with it (and the audience may take matters into their own hands, as well, and eject the irritant). I hope your talk was filmed, and that we can see it on Youtube? Thanks for the tips! And no, no film. I would say, talk about the mistakes you made along the way that taught you something that you didn’t know you needed to learn. Thanks, and I’m saving this post for future reference.